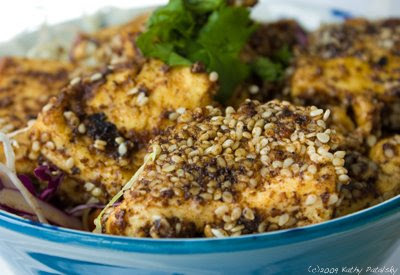 Recipe: Sesame Peanut Crusted Tofu. Vegan Delish. I'm always jealous when my husband orders a sesame-crusted non-vegan dish - like salmon. 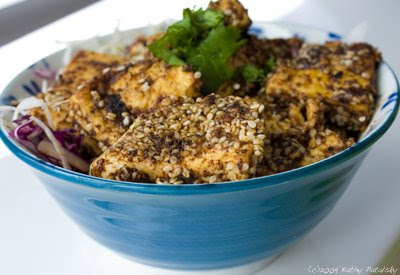 Sesame-crusting is a common way to prepare fish, but I rarely see 'sesame crusted' tofu recipes. (Though I see cornmeal crusted tofu often.) So, I took matters into my own hands and created this recipe for Sesame Peanut Crusted Tofu, peanut-dipping sauce on the side. Crusty Crust. 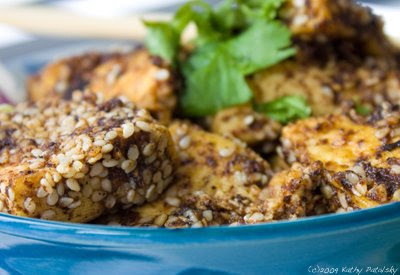 This simple dish combines a few of my favorite flavors: creamy peanut butter, white sesame seeds, garlic, ginger, soy sauce, red pepper flakes, lime and sweet agave syrup. It's the perfect blend of sweet peanut flavor with enough garlic-chili spice to wake up your senses. Tofu Buzz. There are a million ways to prepare tofu. But this is one of my favorites. 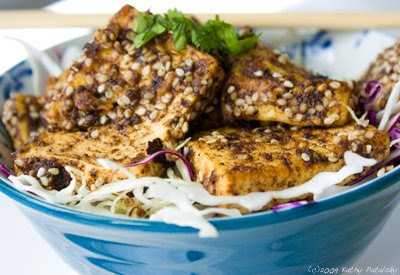 I love the richness of the peanut sauce combined with the fluffiness of the steamed-sauteed tofu. 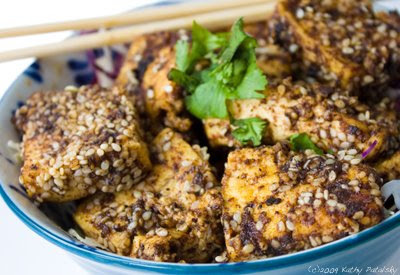 Serve this tofu over a warm bed of brown rice and steamed veggies or colorful shredded cabbage and you have a healthy, happy meal. Add oil, garlic, ginger, peanut butter, agave syrup, lime juice and a pinch of sesame seeds. Saute on medium-high heat for a minute. Chop into cubes or thin slices and marinate in 3-4 tbsp soy sauce soy sauce and 2 Tbsp water for five minutes (while you do the first saute above). Add tofu to pan with the peanut mixture. Stir/toss well over high heat for a minute to coat tofu. Cover pan and allow steam and heat to cook tofu for a few minutes. Constantly move covered pan around, to preventing burning. Uncover pan and check for doneness of tofu. It should be fluffy from the steam and cooked through. If the mixture looks dry, add a Tbsp of water and a tsp of soy sauce and re-cover to steam. 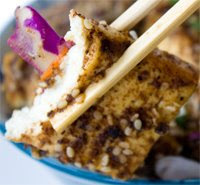 Once the tofu looks fluffy with a few browned edges, turn heat to medium-low. 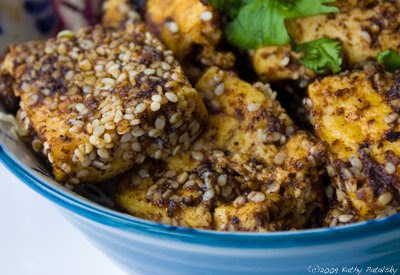 Sprinkle in red pepper flakes and toss tofu a few times-gently. Pour in sesame seeds. Allow the seeds to stick to tofu. Add more or less if necessary to coat about 1/2 of the total surface area of the tofu. 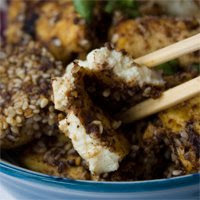 Saute sesame crusted tofu for a few minutes- uncovered. Sesame seeds should be crusted and lightly toasted. Serve over a bed of fresh chopped cabbage or on a bed of steamed veggies and brown rice. Optional: add chopped garlic and/or crushed peanuts for a chunky sauce. Miso paste is an awesome add if you have it on hand. *add water to thin the sauce. I used Vermont Soy Tofu in this dish.